Since the formation of this coalition we have seen a vast increase in Foodbanks and deep cuts to our most cherished public services by this dreadful government. How many more people will have to suffer the long queues at Job Centre Plus and imposed sanctions against them for one reason or another. The coalition alleged that there are plenty of jobs available in the private sector which hear and read about via Prime Ministers Question Time, and press. The simple answer is there are very little opportunities available to gain employment. Most of the jobs that’s we all apply for are zero hour contracts which you cannot plan for your future and you will have to call up on a daily basis to see if there is any work available at times. Yet the burning issue the current UK coalition government have failed to address is Mental Health issues and the lack of funding to improve services which have been high on the agenda of leading press and mental health organisations which this coalition is not addressing. Mental Health organisations are no strangers facing cuts from Central, European and Local Governments funds if anything they have put in conditions for charities bids which makes it virtually impossible to bid for services for them to tender their bids on the one hand but on the other hand the previous Conservative Government under both Thatcher and Major were happy to CCT to contract out NHS mental health services by using Care In The Community and Compulsory Competitive Tendering. Under the leadership of John Major the Conservative government pursued Compulsory Competitive Tendering almost as a dogma, often against the wishes of local government. This led to an uncomfortable stand-off between the two, with CCT regulations being produced in increasing detail, and sometimes extending further than would have been the case in the private sector. The government was unambiguous about what was required issue of tender, receipt of tender, selection of provider. The term compulsory competitive tendering was superseded in 2000 by best value. Labour’s Best Value proved more difficult to define. The notion of Best Value prior to implementation was enshrined within one key consultation document: Modernising Local Government Improving local services through best value (DETR 1998a). This set out four defining elements of Best Value. The first was the duty to secure economic, efficient and effective services continuously (the ‘3 Es’). The second required service reviews within which the authority must demonstrate that in the fulfilment of their duties under Best Value they have: compared their service provision with that of other private and public providers; consulted with local business and community; considered competition in provision; and challenged the reasons for, and methods of, provision (the ‘4 Cs’). The third defining element introduced a regime of audit and measurement of performance, with the broad expectation that, year-on-year, costs would reduce and quality would increase. Performance would be monitored locally through Best Value Performance Reviews (BVPRs), partly through adherence to locally and statutorily determined Best Value performance indicators (BVPIs), and disseminated annually through Performance Plans (BVPPs). The fourth defining element of Best Value outlined the consequence of performance: Government intervention in cases of Best Value failure, and reward in cases of success. The paper does not attempt to define what best value in housing is that is primarily a matter for individual local authorities in consultation with local people. The primary intention is to explain the process framework within which local housing authorities will need to operate in obtaining best value in housing (DETR 1999, s.1.3). Therefore, while the message was unequivocally that Compulsory Competitive Tendering was to be withdrawn, the replacement was to be less prescribed, with the intention that local authorities follow a responsive and locally determined method of service provision within a centrally defined framework. Best Value was not, therefore, about what local authorities should do: it was a framework that prescribed how they should decide what to do. Specifically Best Value would differ from Compulsory Competitive Tendering in three respects: organisation performance, organisation process, and the relationship between process and performance (Boyne 1999, p. 2). A recent report suggests is a grim reading for those involved in mental health care. The survey of GPs revealed that one in five had seen patients harmed as a result of “delays or a lack of support” from mental health services, while shortfalls had forced 82 per cent of doctors to act “outside of their competence”. While this news is shocking, it is just another example of the UK’s mental health care crisis. Such spin only plays into the rightwing agenda also plays into the agenda of the American Tea Party which loves to show that they are no soft touch which the UK Conservatives are adopting on the one hand and on the other hand using Neil Kinnock speeches to try to woo the left. 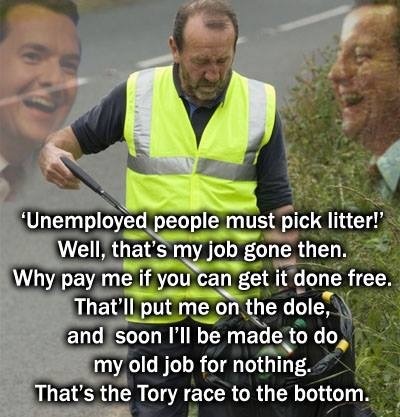 Conservatives has not outline in their manifesto how are they going to promote more employment to involved youth unemployment but they are happy to use the spin to curry votes from UKIP supporters back to the conservatives. I also think that the billions wasted on Trident could be better spent, by investing more in job creation in our public and third sectors this will help the fall of youth unemployment and training to learn new skills. David Cameron said about 50,000 18 to 21-year-olds would be required to do daily work experience from day one of their claim, alongside job searching. The welfare shake-up would make sure young people “don’t get sucked into a life on welfare”, he said in a speech The Conservatives are focusing on welfare reforms this week as they draw up battle lines before May’s general election. 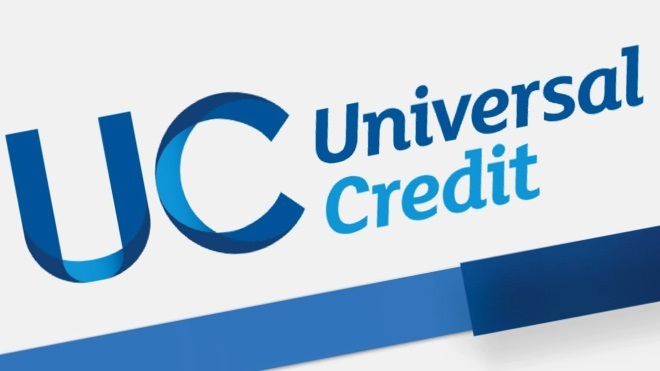 Their proposed community work programme will cost about £20m to deliver, paid for by “initial savings” from the delivery of universal credit. Those aged between 18 and 21 who have not been in employment, education or training, known as “Neets”, for six months would no longer receive jobseeker’s allowance (JSA). Instead, they would be paid the youth allowance, paid at the same rate as JSA – £57.35 a week. However, to receive it they would be required to carry out 30 hours a week of mandatory community work from the first day of claiming benefits. This could involve making meals for older people or working for local charities, alongside 10 hours of job hunting. 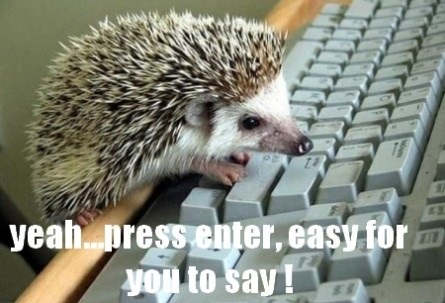 The Conservatives insist unemployed young people must work for their benefits. The Conservatives would make more cuts: lowering the benefit cap, stopping many 18 to 21-year-olds claiming housing benefit and even considering docking money from obese or addicted claimants who refuse treatment. Once again I have to say to UKIPPERS, Conservatives, Libdems and other political parties who cold calls to gain my vote. I’m a staunch Labour no matter what the outcome during the good, bad, and ugly times I will remain with Labour and when I disagree with their policies I will critize within the party and not outside to bring about change. 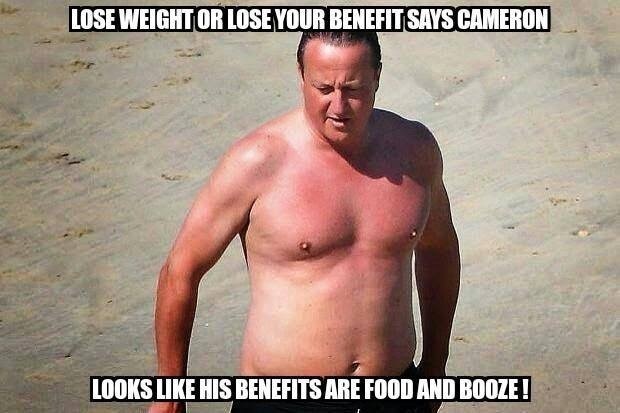 This is so rich coming from David Cameron he wants to carry out a review people who are overweight and drug problems or face losing your benefit. How out of touch he and his party are. 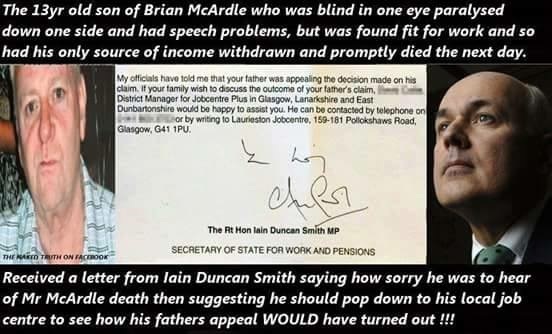 Well the Tories have opened up a can of worms by out doing themselves. 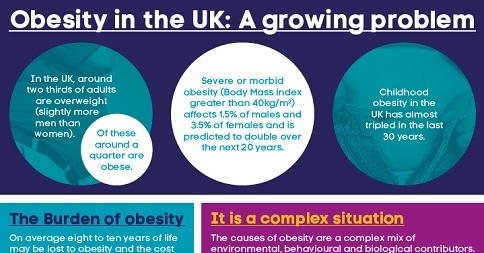 Let’s take a look at some of the issues surrounding obesity such as medical conditions which cause a person to gain some weight this incorporates in some form of disability which does affect their social mobility to do very simple tasks. Nobody likes to be obese and they have done all they can to help combat their obesity like doing light exercise. Oh let’s not forget that some people are on the waiting list of the NHS to have an operation to lose weight. Instead they (Coalition) should continue investigating the root causes of the obesity such as looking into cheap foods which contains fatty ingredients such as sugars, and salts. The last Labour Government did do some programmes to address the concerns during their time in government. How convenient the Tories forgot to mention it’s little wonder they want to stop welfare to the poorest in our society. This nothing short of a political gimmick to gain support to gain votes. This is not the way forward as it rubs people up the wrong way. 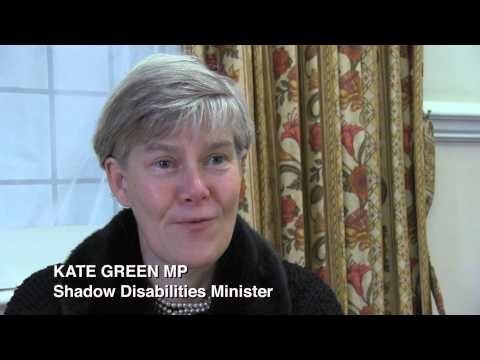 I have to concur with the Shadow Disable Minister Kate Green sentiments “David Cameron’s government has strip back funding for drug support programmes their work programme has just helped just 7% of people back to work so it is clear the Tory plan isn’t working. The programme does nothing to help people off benefits and into work while the government continues to fail to clampdown on tax avoiders and offshore tax havens”. There is no easy way to say it David Cameron promotes the “Big Society” and “We’re All In It Together” what he really mean is “We’ve In Our Necks In It Together” and there is one law for the rich and another for the poor. By kicking the poorest who are on various welfare benefits which opens up another Pandora box of the 1980s which drove up unemployment under Thatcher’s watch as she encouraged people to go in the dole as coal mines, industries and manufacturing were closed down by the Conservatives. I really have to wonder on the otherside of the coin the hidden agenda is to gearing up for people onto the universal credit benefits in which I would say that one size does not fit all. What may work for me on universal credit may not work for Job Blog in this sense. 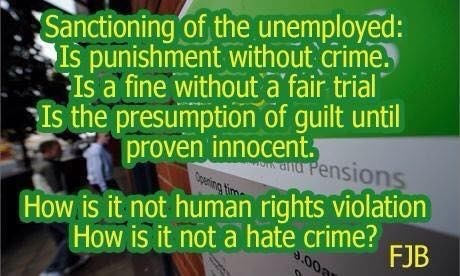 The sad thing about this coalition is they are sounding like a bailiff company who likes to use threatening force to bully those most vulnerable in our society to force them back into employment when there is so few jobs available in the market today. It’s little wonder that David Cameron sees the wide ranging welfare reforms introduced in this Parliament as part of a “moral mission”. 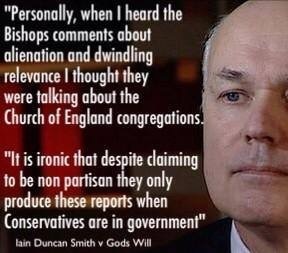 He also knows taxpayers who fund the welfare state like policies which ensure benefits only go to those who need them. So despite criticism of what some see as an increasingly punitive benefits regime, the Conservatives are floating a new suggestion possible sanctions for those claimants who refuse help to overcome treatable conditions. 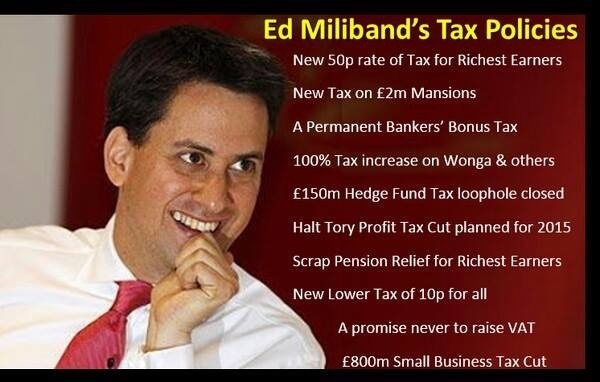 On the same day, during a speech in Wales, Labour’s leader will pledge to continue his attack on tax avoidance. So David Cameron runs the risk of being seen as someone wanting to crack down on some of society’s most vulnerable, while Ed Miliband targets the wealthiest. We all moan, we do nothing, we just sit on our sofas instead of doing our civil duty to register to vote but instead we are perfectly happy to see a right-wing party to get in by the backdoor. Do your civic duty to put an end to this on 7 May by turning up to the polling station and use your vote. Welcome to the Conservatives if you have a substantial donation to give to the party. I’m sure many will have noticed that in three months’ time we have a General Elections coming and each of the political parties are jockeying for positions to gain our votes. 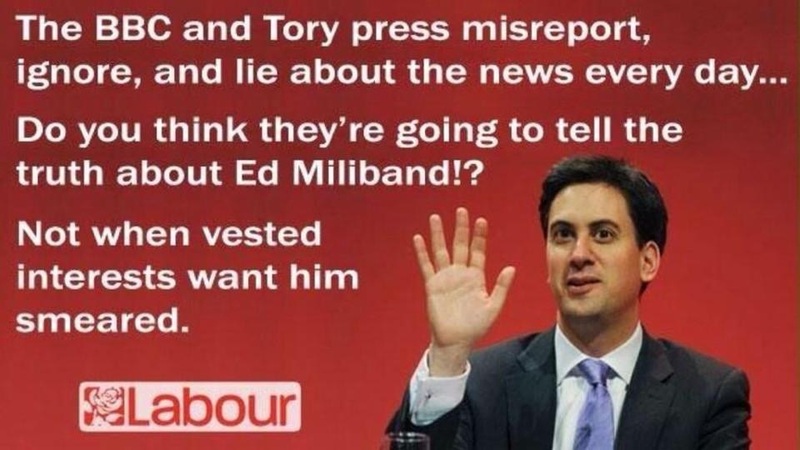 It’s no wonder why the timing of tax avoidance/Hedge Funds is very much in all the press, social media, and in the public interest since Ed Miliband put the questions to David Cameron during Prime Ministers Question Time(PMQs) and all David Cameron can do is to put the blame on Labour then have the bloody cheek to say that Labour are in the pockets of the trade unions and conveniently forgetting that the hedge funders are in the pocket of the conservatives who allows them to be granted peerage in return for their extra-large donations to the Conservative Party. I must say I was glad when Margaret Hodge MP from the Public Accounts Committee (PAC) broke the news followed by Ed Miliband and BBC Panorama in the first instance whilst I’m happy that the Public Accounts Committee (PAC) plan to investigate the sandal which will require the former HSBC to provide evidence. On the one hand I’m saying yeah right a conservative peer to give evidence. On the second hand they must think we’ve got muggings written on our forehead, who are you kidding its beggars belief that a Conservative peer will just volunteer the information without any sweetheart deals in the pipeline and how long will this take secondly how much will it cost the public purse strings to carry out this whitewash investigations it’s like adopting a donkey for the sum of £2:00. Over the past five years the personal wealth of these 1,000 people has almost doubled. In 2009 they possessed “only” £257bn. This poses an obvious question. Over these years the real incomes of wage-earners fell by 9 per cent. How, then, did these very rich people, few of whom work in any conventional sense, manage this amazing feat of wealth accumulation? Tax-dodging may provide part of the explanation. The practices of the HSBC’s Swiss subsidiary represented only a small part of a very big iceberg. “Wealth management” is one of the main activities of all the big banks. Research conducted for the PCS union estimates that tax evasion cost Britain £80bn in 2014 and tax avoidance another £25bn. On this front it’s one law for the rich and one law for the poor. So-called “benefit fraud” represents just 1 per cent of this total. While the poorest 25 per cent pay almost 40 per cent of their income in tax, the richest 25 per cent pay only 35 per cent figures which will inevitably exclude undeclared wealth hidden away in Zurich or the Bahamas. This is why the Labour Party is quite correct to call for Britain’s offshore territories and crown dependencies to establish public registers of the ultimate owners of all companies and accounts based in their jurisdiction. In the wake of the 2008 banking crash the previous Labour government established the Independent Review of Britain’s Offshore Financial Centres. Its purpose was to establish just how much money passed through these centres. The Bank of International Settlements provided an estimate of the total cash flowing annually into tax havens across the world as $3.6 trillion (£2.4 trn). Of this total, British tax havens accounted for over two-thirds, considerably in excess of the value of Britain’s gross domestic product. 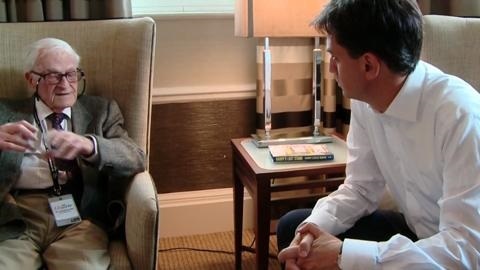 So it’s no surprise predictably Mr Miliband’s call for a register of ultimate ownership has brought cries of outrage. 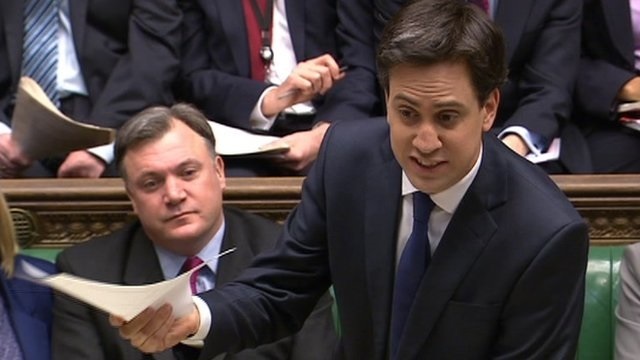 George Osborne dismissed Mr Miliband as “anti-business” and “unfit for office” even though Osborne was quite happy to serve for three years in government beside Lord Green, who presided over HSBC when it was fiddling tax. Intriguingly HM Revenue in a nutshell has said it was forward a bundle in 2010 from France regarding possible evasion by HSBC clients. They alleged that they were prevented by an international agreement from sharing information about HSBC possible involvement in tax evasion. My conclusion will be if those in concern paid their fair share of taxes the revenue could be used to fund our public services like our leisure services, public highways, build more council housing, hospitals, council tax, police, children and adult, disabilities, learning, mental health services. Damned if you do damned if you don’t speak out for not being socialist enough. I hear and read in some quarters of the left and right wings press which includes social media. Now that I have got this off my chest I move on and take a step further to say if China can embrace the ideology of opening up parts of the country to allow foreign businesses to invest and criticised their investors for tax avoidance then what is good for the goose is good for the gander. Tax avoidance in the UK in my opinion is one of the biggest problems that we have which both previous and present governments have continually failed to consistently addressed. They are more concerned about big corporate and international companies yet they seemed to have failed our small business communities who help to build our economy. It’s also been alleged 12 conservative donors benefited by up to £15 Million each due Chancellor Osbourne’s cut in top rate of taxation when the coalition came to power in 2010. 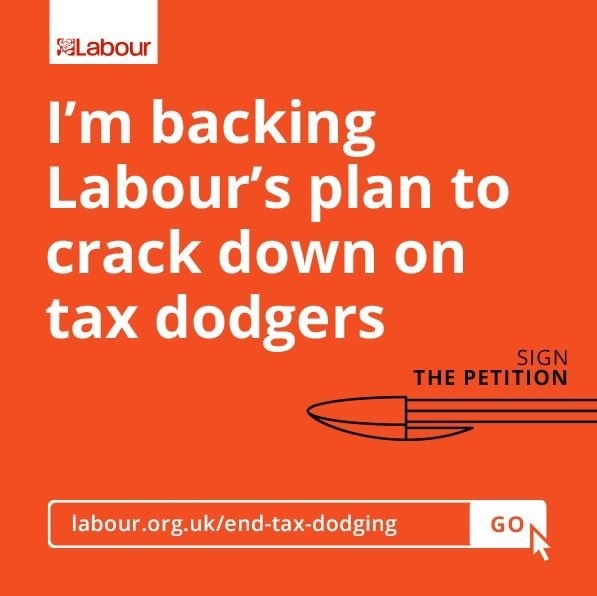 Labour needs no lessons from conservatives over tax avoidance. It’s no surprise that in a survey from the forum of Private Business (FPB) found that over three quarters of respondents think big firms put profits before ethical standards. 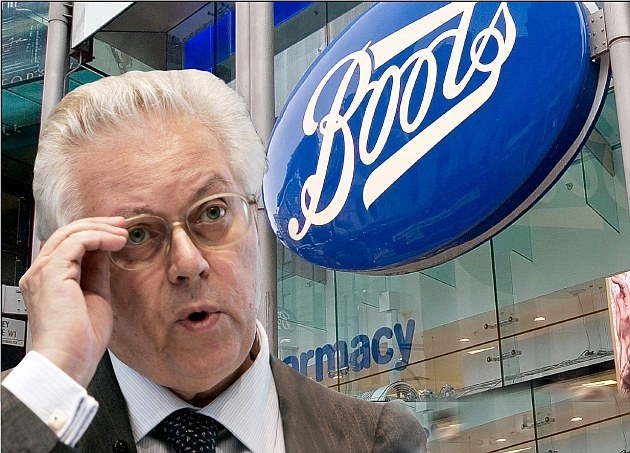 Boots billionaire boss Stefano Pessano lives in the Monaco tax haven and shifted the company’s headquarters from Nottingham to Zug in Switzerland to minimise corporation tax. The sheer cheek of this man in thinking, despite paying no tax in Britain, that his views on who should be elected prime minister merit a hearing beggars belief. 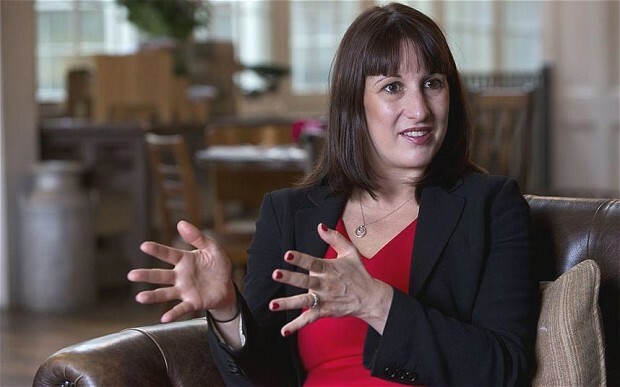 Labour’s problem in recent decades has been that the party has paid more heed to such people than it does to working people and their organisations. Tax avoidance, treatment of suppliers and late payment were all areas of concern, the ComRes poll of 2000 people found. Politicians must stand for people who play by the rules, the FPB said. For all the faults that Lord Mandelson he his right to support Ed Miliband when he said “Ed Miliband is not anti-business and firms will become more reassured about his stance by the election”. “Ed Miliband backed business responsibility as does the vast bulk of business itself and needed to counter the negative publicity”. 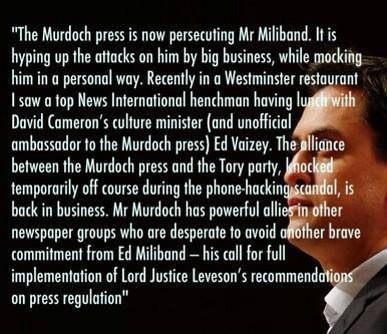 Lord Levy said “Business leaders should not fear Labour. The party would work with business if it is granted power in May”. You have to admit like them or loathe them one has to give credit where it’s due for both Lords to speak in defence of Ed Miliband. It is great to be here in Labour Nottingham. First of all I want to thank the Association of Labour Councillors and the LGA Labour group for coming together for this Conference. I’d like to thank Jim McMahon for the introduction, Simon Henig and Hillary Benn for all of their work. I want to briefly talk to you today about what we are fighting for in this election and about how we change the country. There is a big choice at this election: about how we are governed and who we are governed for. This election is not just a choice between parties, but between two competing visions of the country. The Tories have their idea: choose to give priority to those at the top and let the wealth trickle down to everyone else. Working people are £1600 a year worse off. The worst record on living standards since the 1920s. Promises on the deficit broken. Now the scary thing is they call that a success. It is not, it is a failure. It is failing the British people. And it will keep failing the British people. 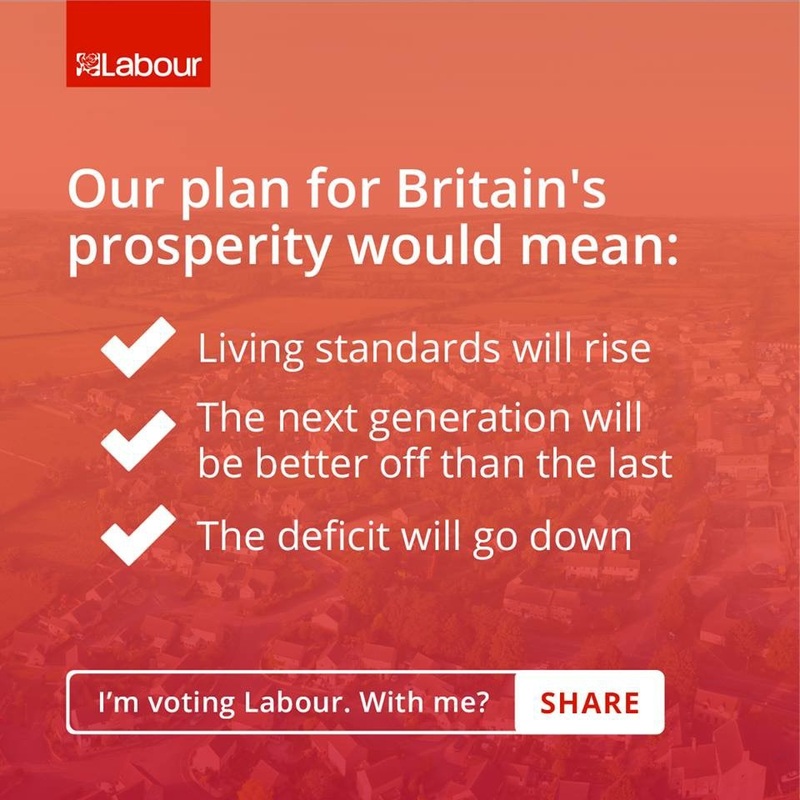 My idea is different: it is based on the idea that when working people succeed Britain succeeds. And so we have a different plan. And I want you to talk to you today about that plan. And you know, that plan is based on the idea of fair rules for all throughout our society. When you are working every day in your communities to deliver services, you are being let down by a government that operates one rule for those at the top and another rule for everyone else. Today, we have a government planning real cuts in spending on schools but one that only postures—and does not act over the scandal of tax avoidance. Let me say to the Prime Minister: it’s not pro-business to defend tax avoidance. Britain is losing billions of pounds in lost revenue that could be invested in our future. It is costing everyone who pays their fair share of taxes, including millions of British businesses. Businesses and working people who pay their taxes, do the right thing and play by the rules are affronted by tax avoidance. And they are fed up with a government that has failed to act. If you want a clear example of this, then you just need to look at tax havens. Over 18 months ago David Cameron promised to shine a light on tax havens linked to the UK. But the light hasn’t come on. Their affairs are still shrouded in darkness. Today I am serving notice on these tax havens. They will have six months from the day the next Labour government takes office. Six months to open up their books and put their house in order. If they do not do so, they will be put on a blacklist and face sanction. 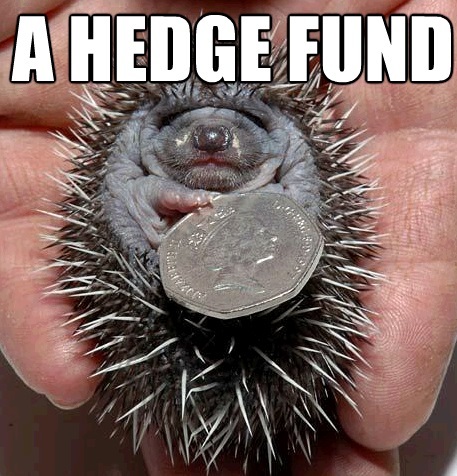 The current Conservative leadership have become the political wing of offshore hedge funds. Unlike them, we will not stand by. We will ensure a country where everyone plays by the rules, from top to bottom. And we need to do so much more to restore the basic bargain of our country. And you are essential to that work. In every area, I see Labour in local government leading the way and being at the heart of the next Labour government’s work. We need to reward the hard work of all working people, not just those who get the six figure bonuses. This is a value we understand in the name of our party. But it is a value that is not honoured in Britain today. So we will raise the minimum wage to over £8 an hour, more than average earnings over a Parliament. We will end the scandal of exploitative zero hours contracts. And we will support the Living Wage – something Labour councils up and down the country have pioneered, becoming Living Wage employers. And just as Brent announced that they will give business rates relief to local employers who pay a Living Wage, so too, we will give tax breaks for companies who pay a Living Wage. But we also know that part of what we must do is ensure that great businesses can create good jobs at decent wages. And you are essential to that. At the heart of a Labour Governments first Spending Review will be the devolution of £30 billion of funding to county and city regions – over three times as much as the current government. Local communities will get control of their economic development and infrastructure spending – including housing, transport, skills and business support. We will make sure local communities have the power to integrate transport services with infrastructure and growth plans by giving them the same sort of transport powers London has. And we will ensure a fairer distribution of central government grants and provide long-term settlements to councils so they can plan ahead and reinvest savings. Now there is a debate about devolution, our plans and the Tories. Ours is radical not timid in resources. Ours is driven by local people, not by top down diktat in models of governance. Ours is comprehensive across Britain, devolving power to every city and county region, not just some, while theirs is piecemeal. And one other thing: ours is based on the right values for the country not the wrong ideology. Funding cuts up to sixteen times more severe for some of the poorest parts of our country, including in the North of England. And now he wants to go back to the 1930s in public spending as a share of national income. That means they are not even half way through the cuts. Just think what that would mean for your community. For meals on wheels, for social care, for youth services, for all local government services. He is no friend of Local Government. His plan is a clear and present danger to the people who live in your community. Our plan is also built on the idea that our prosperity now and in the future depends on the skills, talents and opportunities of all our young people. 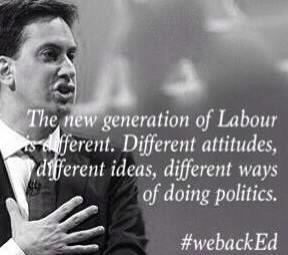 So a Labour government will have proper vocational education and apprenticeships for our young people. We will get young people back to work with our Jobs Guarantee. Taxing the bank bonuses to get jobs for the young. And we will build on the work of Labour councils like Nottingham, Leicester, Birmingham and Haringey whose Jobs Funds have got hundreds of local young people back to work. And we’ll build homes again for young people to buy and stop private landlords ripping them off. Another thing Labour councils are leading on – with over five times as many social homes built in Labour authorities as in Tory ones. Labour taking action where Tories stand by. And we won’t just build a better economy but better public services, on which working people rely. Again you are crucial to this. Its time there was proper local accountability for local services. And we will turn our health service around. With a £2.5 billion time to care fund to support more midwives, care workers, doctors and nurses. Not for the NHS to stand still but integrating the NHS, social care and mental health as never before. 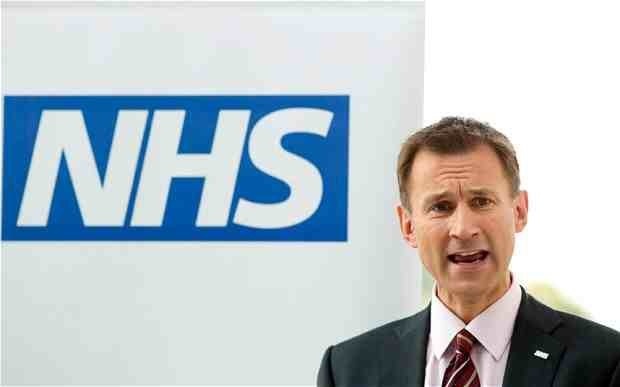 And an NHS with the right values; cooperation, care, compassion, not privatization, fragmentation. And that is why we will repeal the Health and Social Care Act. And we will do all these things, with every penny that we spend paid for and funded, not from extra borrowing. We will bring the deficit down every single year, until the books are balanced. We’ll get rid of wasteful spending and make sure the richest pay their fair share. And you know it won’t be easy. There will be reductions in spending outside protected areas. And we will learn from the decisions you have made, doing more with less. As I go round the country talking to people about this election, I know people don’t believe this is as good as it gets for Britain. I know they are yearning for a different direction for Britain. If you want an £8 minimum wage, vote Labour. If you want to devolve power to local people, vote Labour. 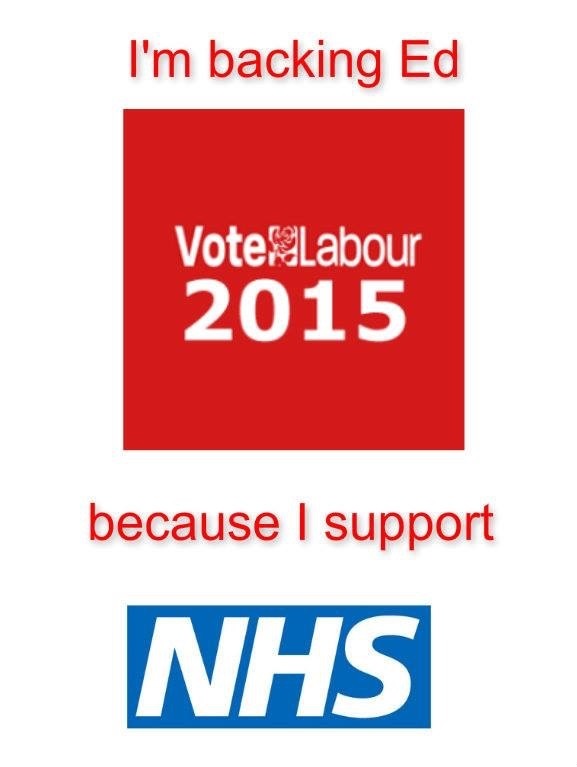 If you want to rescue the NHS, vote Labour. 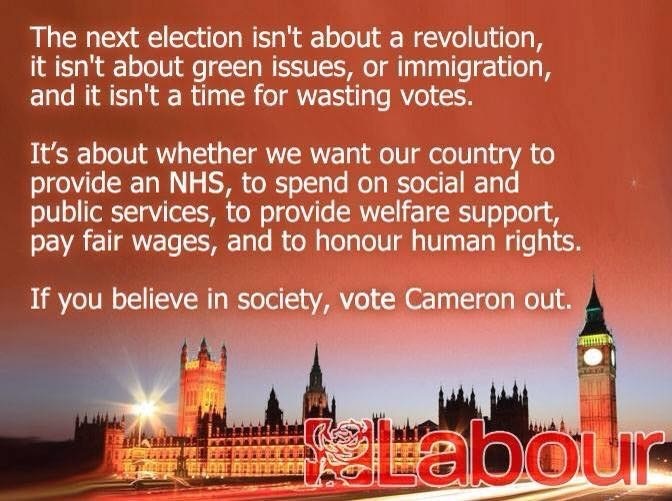 If you want a more equal, more just, more fair society, vote Labour. So in 88 days let’s make sure Britain has a Labour government. And Labour Councils up and down Britain. Because that is how we will change this country. By my calculation after the general elections should there is a marjory or another coalition pack with conservative the jaws of doom will be implemented as the coalition would love to see a health insurance based in place. It’s no wonder why they are being supported by hedge funds in return for a piece of the pie in return to have parts NHS and Social services being partly privatise and more zero hour contracts will increase under conservative or conservative coalition. Don’t be surprised the next time you turn up to the NHS or use social services they will ask to see your health insurance. With this in mind the nation will not recognize our public services as we once knew it. Naturally people are concerned about our public services which were the vanguard of our community. Chancellor George Osborne says he will put an extra £2bn into frontline health services across the UK, which he described as a “down payment” on a plan drawn up by NHS bosses calling for an extra £8bn a year above inflation by 2020. In England, everyone would be able to see a GP seven days a week by 2020. Recruit 5,000 more doctors. An extra £1bn for the NHS every year, to be funded by – amongst other things – making higher earners pay more tax on their shares. Half of this will go towards mental health. People who need therapy for conditions such as depression will be guaranteed treatment within 18 weeks. For young patients experiencing psychosis for the first time treatment will be provided within two weeks of being referred by a GP. This is all going to happen from April, with more mental health targets to follow if the Lib Dems return to government. Wants a cross-party review of the future of NHS funding. An extra £3bn per year in NHS funding paid for by quitting the EU and through “middle management” cuts. Keep NHS free at the point of delivery. Stop any further use of PFI, and encourage local authorities to buy out their PFI contracts early where it is affordable to do so. Ensure all visitors and migrants who have been here for fewer than five years have NHS-approved medical insurance as a condition of entry to UK, with £200m of the £2bn saved to be spent on ending hospital parking charges in England. Bring back state-enrolled nurses and return powers to matrons. Monitor and Care Quality Commission to be replaced with elected county health boards. Stop spending £90m a year on gastric band and breast enhancement operations. Funding to be diverted away from centralised facilities towards community healthcare, illness prevention and health promotion. Stop privatisation. Abolish prescription charges. Dedicated NHS Tax to go direct to the health service. 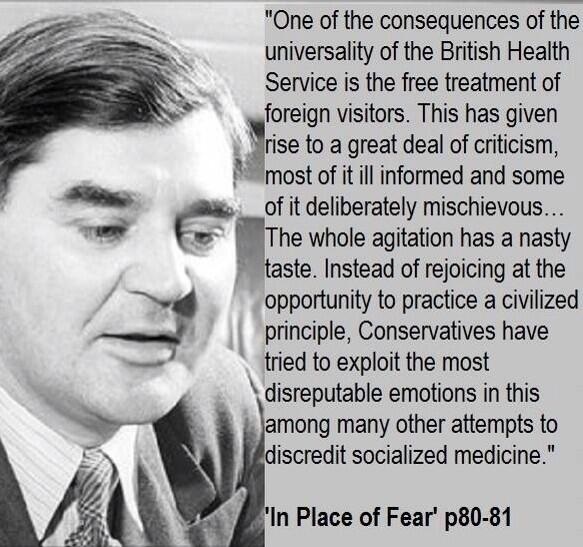 Ban proactive recruitment of non-British NHS staff from overseas. A complete ban on the promotion of tobacco and alcohol products, including sponsorship. Backbench Business Debated on 15 January, Labour believes it is right that this important issue is debated in Parliament and they agree that those proposals deserve proper scrutiny at both a UK and EU level. Labour supports trade agreements which can bring significant benefits through boosting trade and growth, securing and creating jobs, and bringing down costs and extending choice for consumers. The transatlantic Trade and investment Partnership (TTIP) trade agreement between the US, the world’s largest economy, and the largest single market, the EU, has the potential to bring significant to bring significant benefits. The US is the UK’s biggest export market and likewise the UK economy attracts a significant level of Foreign Direct Investment (FDI) from the Atlantic. That’s why Labour supports the principles behind those negotiations and recognizes that more and better trade is good for the UK. We share the concerns about the impact that TTIP could have on public services encouraging commercialisation, particularly in NHS. Labour believes that NHS and all public services need to be more, not less, integrated. That is why we believe that the NHS should be exempted from the agreement. Other countries have sought to exempt areas from the agreement but this Government has not done this. Labour will continue to press for exemption. There is a major concern that ISDS provisions could hinder our plans to reverse the privatisation of the NHS as it could result in those companies seeking compensation for loss of potential earnings. We believe that it is a right of governments to able to legislate in the public interest and this should be protected effectively in any disputes resolution mechanism. 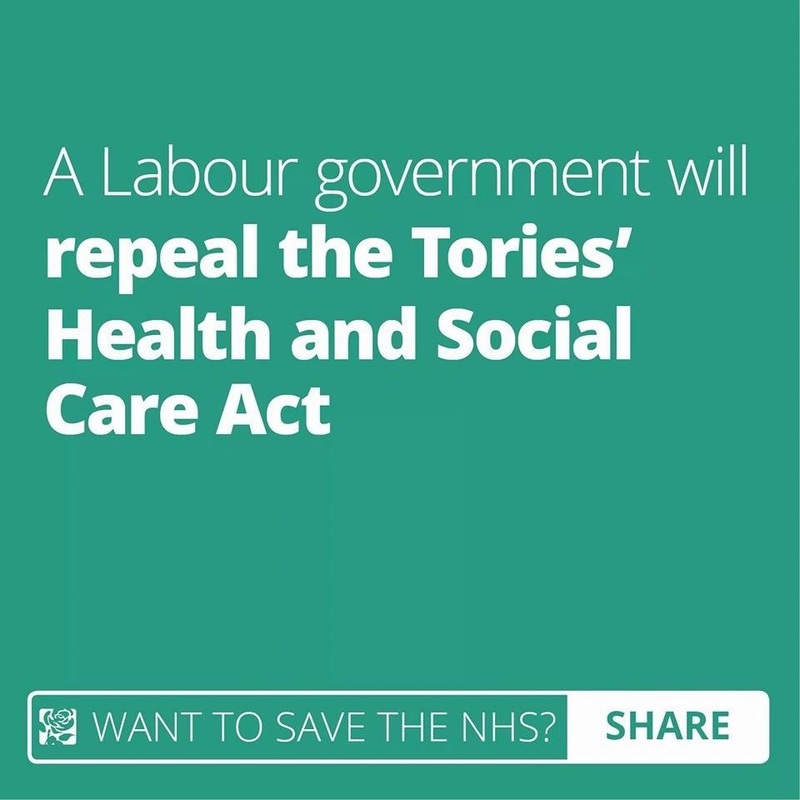 Labour will be arguing the government to call for far greater transparency around exclusion for legislation in the public interest, like the NHS. The benefits of any treaty must filter down to employees and consumers. Treaties can cement and even increase labour, consumer, environmental, and safety standards. Concerns have been raised that TTIP could reduce standards, Labour will only support an agreement that avoids a race to the bottom and promotes decent jobs and growth and would safeguard standards. A significant stumbling block has been raised that the US states are not covered by the agreement and therefore procurement will not open up but not to the same extent in the US. This is important because significant procurement spend in the US is at the State level. If the Conservatives or a coalition pack with UKIP in the event do win a majority or a hung parliament how fast will they implement TTIP which will have the knock on effect on our treasured public services both in local government and our NHS? Who will hold the budget for NHS or Social Services and how will it be shared equally ensure we have a decent NHS and social Care which will be fit for purpose? Many believe that one of the biggest prizes of the agreement for transnationals looking to expand will be the NHS. When it was first established, the NHS was set up on the basis of social solidarity everyone contributed to the cost of providing the NHS through taxes, and in return healthcare was provided by the state and available for those who needed it, when they needed it. But the Health and Social Care Act (2012) and the regulations for implementing it (especially Section 75) have changed the fundamental nature of the NHS. By fragmenting the NHS, opening it up to competition law and turning the NHS into a market in which private companies can compete to get NHS funding for patient services, the HSC Act has turned the NHS from a social into a commercial activity. it will only be protected from TTIP if it is explicitly excluded from the treaty (which currently it is not). If agreed, TTIP will change the whole emphasis of NHS health care: the priority will become the rights of transnational organisations rather than the care of patients. TTIP will give transnationals the right to bid for government spending, including on health. It will put severe restrictions on the ability of the UK government to control costs (e.g. of medicines) and to regulate any transnational companies that provide health services. 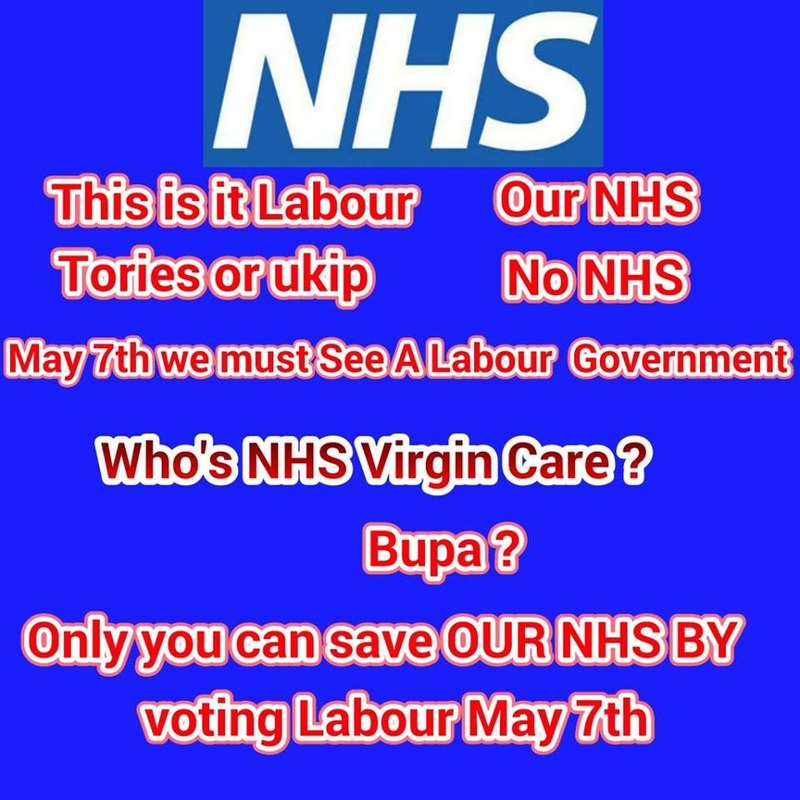 I personally would not trust Conservatives, Libdems, UKIP or the Green Party with our beloved NHS and public services for the many as most has shown their hands on what they want to do to our treasured services as it won’t be at the point of need. “As I stand here today, my heart is with all of those people from my generation who didn’t make it past childhood, didn’t get an education, grow as individuals, marry, raise a family and enjoy the fruits of retirement because they died needlessly and too early in another era of austerity,” he said. “I am not a politician, a member of the elite or a financial guru, but my life is your history and we should keep it that way. Our free NHS is for all. Not for the few shout for it, fight for it, vote for it. The Green Party have gathered up many disillusioned ex Lib Dem voters, the ones who haven’t learned from last time that like the Lib Dems, any party that tries to appear to be all things to all people is not being honest with you. There’s something about the truth that badly disappointed idealists become the readiest disillusioned and resentful cynics that springs to mind, here. However, the Greens are very busy trying to hoover up the votes of all those disillusioned souls on the Left, and regardless of the potentially devastating consequences that may have on the election outcome. The pressing issue for me is that people are suffering, some have died because of Tory policies, our society is being fundamentally damaged, to the point where it will soon be impossible to repair it in our lifetimes, the damage will last, probably for more than one generation. I care about that. I care about the suffering, the damage to our society and country. I’m a socialist because of those long-standing concerns, which transcend parochial concerns and party politics. I am also fundamentally cooperative and community-minded. I care about what happens to others. The Greens are not cooperative or community-minded. They are dividing our opposition to the Tories and risking returning Cameron to Office in May. That is not “socialist”. How “socialist” is it to join ranks with the party inflicting all of that damage and harm on people of this country to attack and undermine the only viable alternative to the Tories? That’s not genuine politics, that’s electioneering. It’s not “socialist” at all. You can’t claim to be a ‘progressive ‘ political party and at the same time advocate zero growth and parochialisation cut-off from global trade. The economy matters to every country in the world, and no growth or low economies increased inequality and absolute poverty. It’s not progressive at all to shut out the rest of the world, and a zero growth economy would be a disastrous experiment, just like the austerity measures have been with the same results. 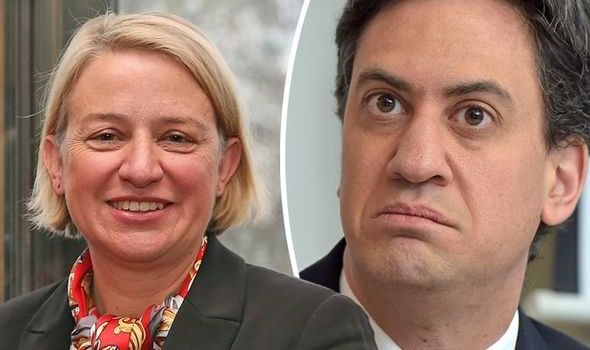 The Green Party fail to show us any understanding of imbalances of power, they provide no class analysis, they aren’t connected with marginalized groups, they don’t reflect their needs and they clearly have no understanding of the mechanics and virtues of redistribution. There isn’t a single policy currently in their manifesto that demonstrates a coherent offer of support to very poorest. That isn’t “socialist” at all. The Greens grew out of the environmental movement, with David Icke at the helm as a spokesperson, well, until they got embarrassed by him and sacked him… As Suzanne Moore commented earlier, the incoherence is even apparent at how they fail to define the State .They offer the biggest of big-state polices with huge intervention in some areas, without specifying the role of the state except as a series of committees. The Green Party’s key policy idea that of a Citizen’s Income for everyone whether they work or not sounds so great on the surface. Just like a lot of their rhetoric and policies, it lacks depth and doesn’t connect up – lacks integrity and falls to pieces when properly examined. Many of the poorest households would lose out. Most wealthy households will gain. How does that address inequality something the Greens claim to be concerned about? If anything, this policy will extend inequality. That’s not very “socialist”. Many critics of the Green party point to their many failures in Brighton and Hove, where they couldn’t even get the rubbish collection right. However, the most damning criticism is their fundamental inability to run services for the most vulnerable is the one that ought to concern us the most. That’s not very “socialist. It’s painful to say this; the Greens have some bonkers policy. With them in charge our Army, Navy and Airforce would be scrapped. There would be no arms companies producing arms in the UK and instead will be converted to make windmills? Fine you might say, but they claim instead of an army they will have a home defence force, (Dads Army springs to mind) but the Greens could not say how they would be armed or how up to date those weapon would be. Partly because they do not like trade and want to curb it. What would the Greens do with the SAS, have them change jobs to be flower arrangers in a church? Now I am not overly keen on arms companies but only because of two things. I do not think arms companies should be allowed to trade with regimes with poor human rights records. Two, I do not feel guns should be made and sold for civilians to use. But other than that if you have an army which we do, then they need weapons. But it’s OK why would we need an army anyhow as there will be no problems with terrorists or threats to the UK around the globe. As the Greens will make it legal to be a member of Isis or Al Qaeda. Yep that is right you will be encouraged to join a terrorist group. You are told not to kill anyone but you’re allowed to think it. You can also help in spreading the views of your lovely little terror group and help fundraiser for them. I guess if they do misbehave it’s OK the Greens will send them to the naughty step or stand in the corner. The Greens also talks about a holy £72 a week for everyone to be paid regardless if they need it or not. Yet does not explain what that means. Would a person who gets that amount of money be classed as unemployed or employed? She then says if someone is rich enough they will still be given the £72 but it will be taken back in taxes elsewhere. Oddly they claim that scrapping all benefits which I think was what was implied by the £72 would save £280 billion. Yet how they reach that mind blowing figure as they could not even say how. However they also think we should not have to bother with some jobs and companies so people can chose to work part time. Sounds wonderful for most, but it also means half the pay and less money paid in tax. Just what it would do to business is anyone’s guess. Not good I doubt. The entire Greens key on referring to was there was short term aims and longer term aims. The longer term aim came across as a fantasy world the Green has seen on a science fiction film. Seeing as they hate trade then you can only what Britain would become under them. I have no problem in tacking inequality as its right that it is. But the Greens live in cloud cookoo. There will be next to no jobs, people would soon be sick to death of only having £71 a week to live on. They will be unimpressed as the Greens also want it seems lots of things not to be made. I am not normally in agreement with Martin Neil but he was right in his questioning. Just wishing something is different amounts to nothing in a democracy. The Green are pure fantasy. In fact I’ll go as far to say they are not a political party as they lack basic awareness of what it means to represent all of society. Not just those views that suit them. They would do better to just become a lobby group. Only not on wider issues but just on environmental issues, they would likely achieve a lot more talking about wind and solar energy. The Greens will give us £30 billion more in cuts to pubic services and welfare and cause thousands and thousands of animals to die for not reason due to blood sport and badger culling. 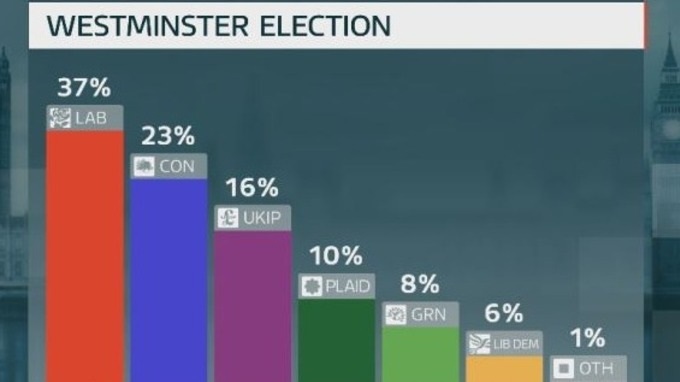 Because to Vote Green is no change in politics it is to keep the Tories in office. For that is what voting Green will achieve. 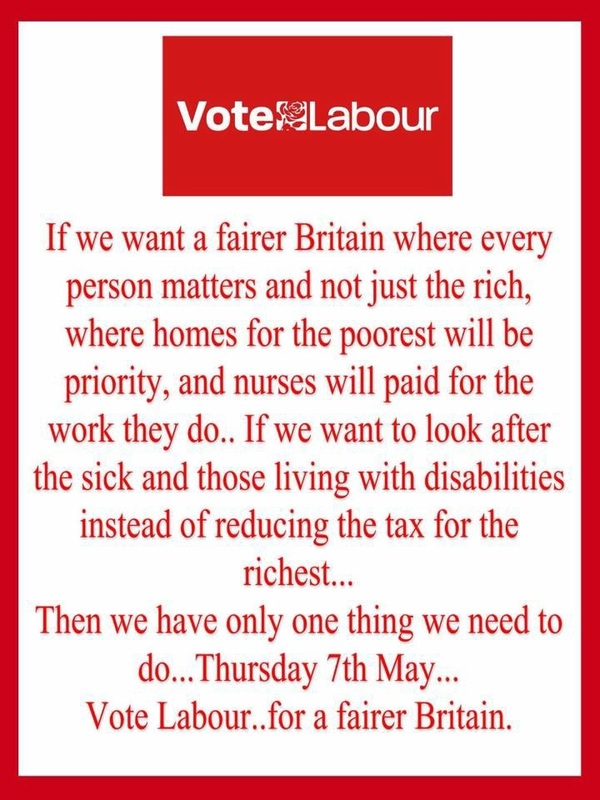 It will not achieve helping one person from the Bedroom Tax, suffering from being treated like dirt by the DWP. It won’t create new jobs as the Greens are anti-growth therefore anti job creation. Voting Green won’t protect us from terrorist because they actually have a policy where it is OK to say its legal to join Isis, or Al Qaeda!!! Is that the brave new world people want? Did I also mention voting Green will not save one fox, one hare or one badger despite what they claim on animal policy. 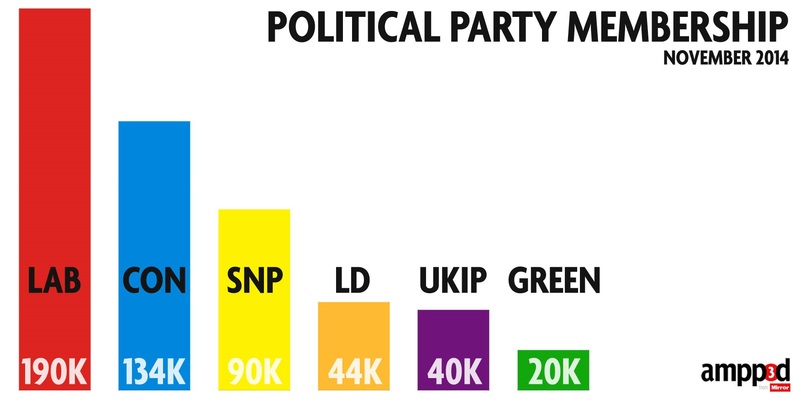 For the small reason in 2010 just over 265000 voted Green, even if they have a small surge it will add to little and will hugely unlikely to increase the number of MPs they have by one! And 1 MP is all they have; they may even lose that one because many people in Brighton are sick to death of the Green Council there. 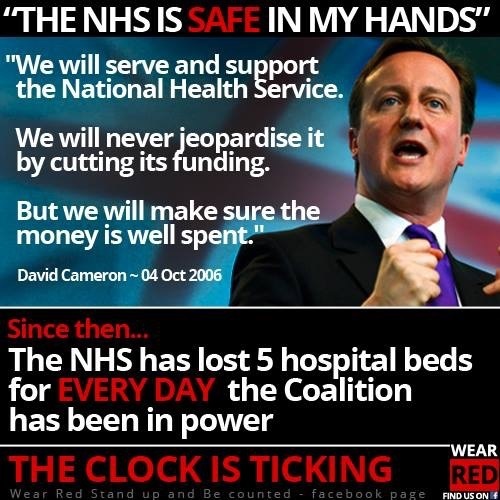 So the facts remain, vote Green get Cameron I am glad I back Labour the Greens are scary.